Thai Travelogue (The Facebook Files) Part Deux: Electric Boogaloo. 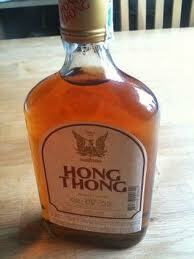 Possibly the best thing I have seen so far: Hong Thong booze. Specified only as “local Thai spirit.” Sold in 40 oz bottles for about 400 bhat ($14) and stored in a milk crate in the sun, away from the other booze, like maybe it’s contagious. This product needs representation. A slogan. I’m thinking a booty-licious girl in a thong, leaning into a car window, shot from the back (of course) with some kind of slogan like “Hong Thong: Deliciously Cheap.” I’m open to suggestions though. One liners aren’t my forte. This entry was posted in Travel on January 18, 2013 by carleigh baker.